Can you guess what the most beloved street food in Thailand is? Believe it or not, it is the THAI BASIL CHICKEN!!! In Thailand this dish is available and eaten everywhere. It is usually served on top of some steamy white rice with a fried egg on the side. This is a well-loved dish by many people for many reasons. Hmmm…. maybe it is the spicy taste, with a mouth-watering balance of savoury and sweet that made us love it!! Drooling already!! 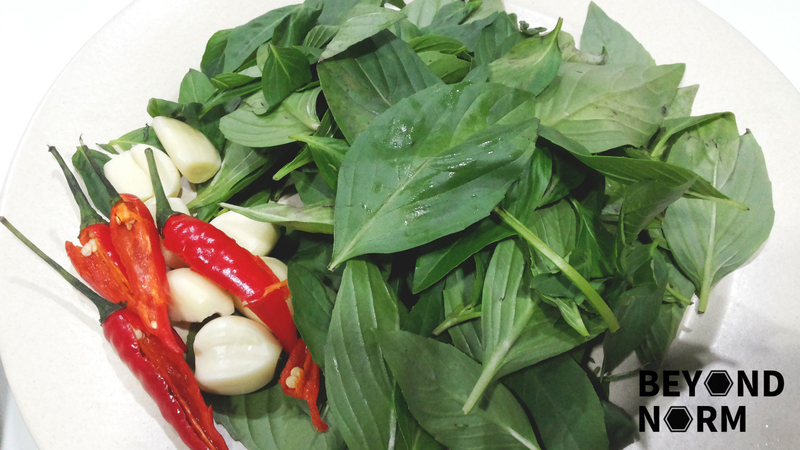 Though it is a very simple dish to prepare and you can cook it without much hassle, most of us will face the challenge of finding this ingredient: “holy basil”. It is normally unavailable in most supermarkets or wet markets but it might be available in a supermarket that specialises in Thai ingredients. It is commonly substituted with sweet basil which might not bring out the same vibrant peppery flavour of that holy basil. Well, well… Unless we have tasted it before or are an expert in this dish, we can never tell the difference. As I didn’t have the time to make a trip to the speciality supermarket, I decided to use the sweet basil to cook this dish. I have made this dish several times before, and it still tastes great to me. One day, I will definitely make a trip to the speciality supermarket to buy the holy basil and try out this dish again. Then I will let you know how it tastes. As for now, I’ll just make do with the ingredients that I have. Once you have tried this recipe, we hope that you could provide us with some feedback/comments either via our blog or by joining our Mummy’s Kitchen Facebook Group. You can like us on Beyond Norm’s Facebook Page or subscribe to our blog via the right side bar to get the latest updates. 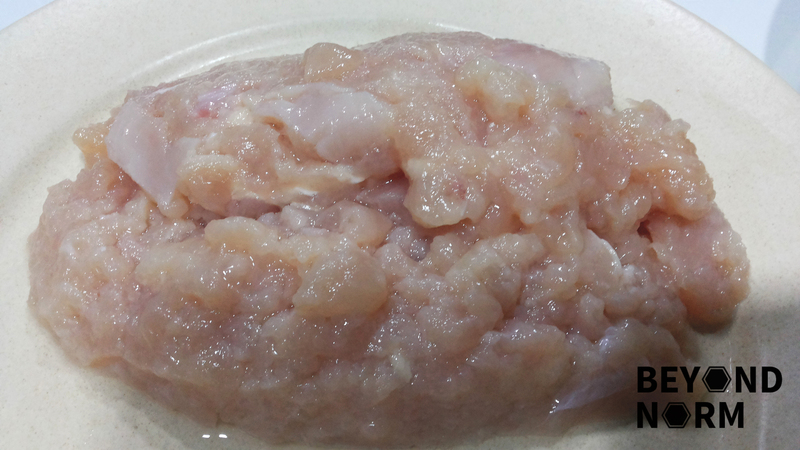 Rinse and cut the chicken into small bite sized pieces or roughly mince it. Rinse and remove the skin of the garlic and deseed the chilies. Roughly pound them in a mortar and pestle. (Alternatively you can just mince them with a knife.) 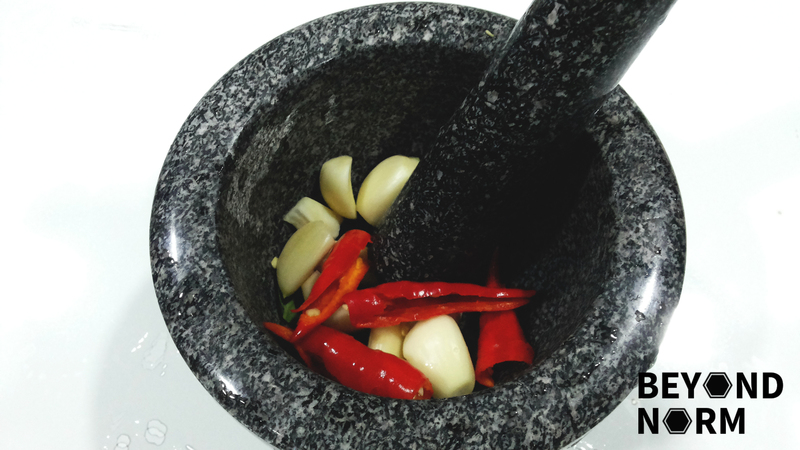 This process helps to bring out the oils and flavours from the garlic and chillies. Pluck a good sized handful of basil leaves off the stems and rinse clean. Heat wok on high heat and add oil. 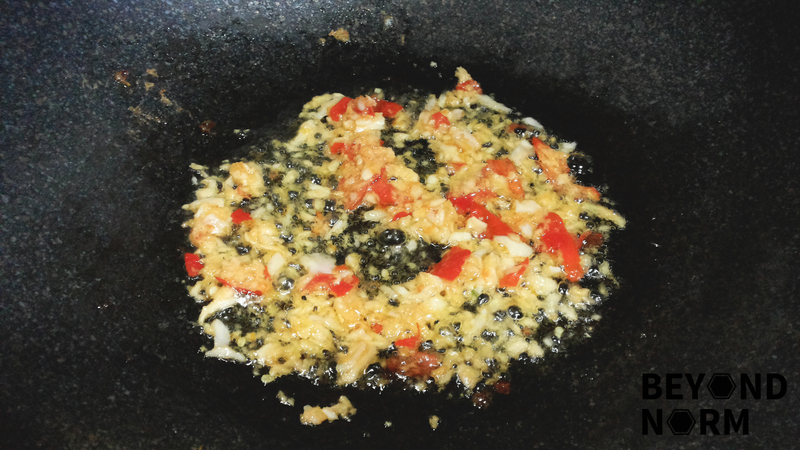 When the oil is hot, add the pounded/minced garlic and chillies. Stir fry till fragrant but not too dry or burnt. Toss in the chicken and stir fry till just about fully cooked. Add in the seasoning and keep stir frying for about another 30 seconds. Grab the handful of basil and toss it into the pan and fold them into the chicken quickly then turn off the heat. Dish the chicken into a serving plate and accompany with hot rice. If you fancy, you can serve it with a fried egg on the side like how this dish is served in Thailand. You can substitute chicken for other meat like beef or pork. Remember that the amount of seasoning and chillies listed here are just a guide – you may adjust them according to your liking! !